I want to tell you about a very cool product my family recently got to review. GoPicnic meals. These are ready to eat meals that require no refrigeration. I was not at all sure about prepackage, shelf stable foods being that tasty, or healthy for that matter. I am happy to report that I was pleasantly surprised! GoPicnic meals come in several varieties. They offer GoMeals, which are a wonderful meal in a box so compact it will fit in your purse. I was amazed at how much was in such a small package! 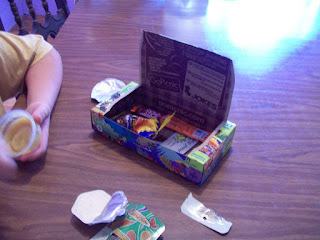 Then you have Break Meals which are a bigger box, chock full of lunch time goodness. We discovered that these make a great meal for Dan when I wake up too late to get his lunch packed. And they even offer a variety for the kids, Mighty Munch Meals. 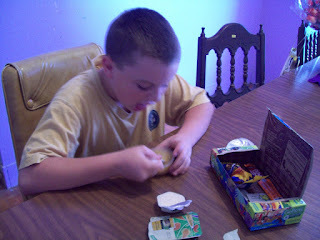 I loved these because the kids loved them and because they were not filled with sugary junk. They offer gluten free, kosher, vegetarian, and even vegan meals! How often do you find "convenience food" that can offer something for all those dietary needs? I can think of so many times that having these great meals around would be handy. Obviously, they would make an impromptu picnic super easy. They would be great to store in your emergency kit in your car, in case of getting stranded on the side of the road for awhile. As I stated before, they make a great lunch when you are rushed for time. They would also be ideal for dorm dwelling college students, much better than eating fast food all the time. Plus, the price is right, being much less expensive than hitting the local drive thru. They are just an incredibly handy product to have around! Unlike a lot of convenience foods, these are not meals packed for of all sugar and fat. Not these! They are full of fruit, whole grains, nuts, and baked snacks. Everything they offer is so much better than your standard quick meals. You won't find any MSG, high fructose corn syrup, or trans fat in any of these yummy meals. I am very impressed. And if you order using the coupon code GPMOMS, you will receive 20% off! 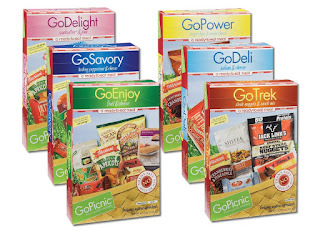 I am thrilled to tell you that three lucky readers will win 6 GoPicnic meals of their choice! Go over to GoPicnic and browse around. Come back here and tell me what product you most want to try. Be sure that you leave your email address in your comment or that your email is available on your blogger profile. I must have a way to contact you. Entry deadline is 08/24/09 at 8:00pm CST. Winners will be selected, posted, and announced on 08/25/09. This giveaway was chosen as an Editor's Pick over at Prizey! I am so super excited! Thanks to all who entered for your interests! It's 8:00om CST, giveaway is now closed for entries! I had never heard of these before..I'm intrigued! I really like the Go Breakfast Variety Pack. I always have such a hard time deciding what I'm going to eat every morning! This pack would be great for those mornings when I walk Mel to school and go straight to the gym!! I'd love to try the mighty munch sampler.. They all look like fun meals the girls would like... Great giveaway! I'd love to try the SunnyBreak meal. Thanks for the chance! I'd like to try the JungleMunch. Jungle Munch for me please! I'd like to try the Explore Munch Turkey Stick and Cheese. I would love to try the Zesty Break: Turkey Pepperoni and Cheese! Sounds delish! I also subscribe to your RSS feed via My AOL. I would like to try the Go Deli. The Sunny Break meal looks yummy! I am sure my little one would love the Galaxy Munch Meal. I'm having a hard time choosing so I would love to try the Mighty Munch Sampler. Thank you for the giveaway! I would like to try GoPower Bagel Chips & Cream Cheese. We would love to try the SportsMunch meal! I would try mighty munch. I'll have to buy some for emergencies if I don't win. I would really like to try the GoDelight Product Sunbutter & Jam. 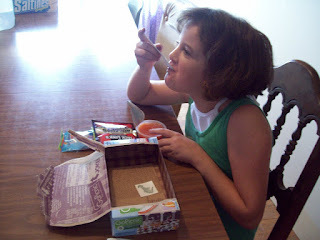 I'd like the ExploreMunch because it is made in a peanut-free facility and my daughter has nut allergies. b/c I never have time for breakfast. Would love to try the GoTrek. Thanks for the great giveaway. I most want to try the GoSavory. This is such a great idea.Some of my favorites that I would like to try are the Safari Munch,Sports Munch, Go Trek and The Go Enjoy.I love the different choices and that they are a healthier than the boxed meals at the grocery store. I would like to try Energy Break, I love those snap peas! What great product! Thanks for sharing! I would love to try the Zesty Break Meal, it sounds delicious! These meals look so great, thanks so much for such a wonderful giveaway! I would like to try Go Energy. I would love to try their GoDeli! I would like the Go trek meals. The AnywhereBreak: Steak Nuggets, Chips & Salsa sounds great! I think the ZestyBreak sounds perfect for my kind of cravings - savory, crunchy, fruity and sweet. yum! I love that they have gluten free options! I'd like to try the ZestyBreak! I'd love to try the Galaxy Munch! I'd like to try GoEnergy! Cool idea! I'd love to try go savory. I would love to try the AquaMunch! I would love to try the Go Primo or the Comfort Break Meals. I am subscribed to your RSS Feed and via email. Go Trek looks good to me. I would like to try the GoSavory for starters. I pick the Galaxy Munch! I'd love to try most of the meals, but the one I'd like to try most is Gourmet On The Go Couscous. The GoSavory sounds great to me! Go Deli or the Galaxy Much. I want to try the GoTrek meal. I want to try GoSavory, with the turkey pepperoni. i've seen these reviewed on a couple blogs - they look so good!! i'd love to try the gopower! the gosavory sounds so good! 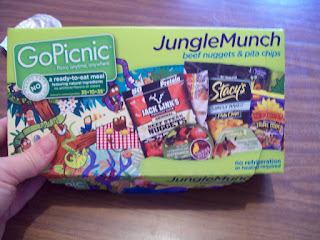 I'd most like to try JungleMunch. Thanks. I'd love to try the GoPrimo! I love Nutella! I would like to try the SportMunch meal. Totally new product to me and I love the idea of it! I would probably try the Go Deli one first but any of them would be good, I think. I would love to try the GoTrek pack, it looks great for a day hike! I would most like to try the ComfortBreak meal. Its foods sound so tasty. I would llike to try the GOBreakfast Variety pack( and also the GoEnergy pack with Hummous! I'd love to try the go trex. I have a college daughter and these would be great for her to stick in her backpack for those times she can't make it back to the dorm for lunch! I could even have them mailed straight to her dorm. I think she'd like the Comfort Break! I'm already subscribed via email. P.S. Like the new look! I most want to try their 'Anywhere Break'. These are great! Croissant & Fruit goprimo sounds good! They all look delicious, but I'd love to try the GoTrek meal - it sounds perfect for when I'm on the go! All the BREAK meals look great, but I think I would like to try the SunnyBreak: Fruit & Fiber the most. Sounds like a great breakfast/brunch on the go! I think the almond butter and jam. . . thanks! I'd like to try the GoPrimo Croissant & Fruit. We'd love to try GalaxyMunch! Hm... The EnergyBreak seems to be right up my alley. GoPower also looks good.